To kickstart the monthly pattern stash interviews Kestrel Makes and I have planned for the Vintage Sewing Pattern Pledge, I'm sharing my own collection today. But first, I want to thank the 120+ of you who have already signed up! What really excites me is the interesting mix of pledges unfolding. You've made ambitious plans like sewing a vintage pattern each month, transforming sketches from historical costume books into patterns, sewing your first ever vintage pattern, and exploring a range of decades. You've also made some wonderfully specific and personal pledges like sewing a 1990s jumpsuit, using a pattern passed down to you by your grandmother, sewing your wedding dress using a 1963 pattern, and plucking up the courage to use the pattern your dad bought you when you were 15. Some of you even sell patterns or make clothes for a living and have pledged to make more time for personal sewing. And best of all, some of you are bringing a new dimension to the pledge by knitting along! So thank you all again for making #vintagepledge so special and let's coerce even more people to join us! I can't pinpoint exactly when I started collecting vintage patterns, but it was around the same time I started blogging, so almost five years ago. I blame it all on We Sew Retro, of course! I'd only just started exploring the online sewing community and when I stumbled across We Sew Retro, seeing everyone's lovely creations was like love at first sight...much to my bankcard's distress! For the purpose of this post I actually counted my vintage patterns for the first time ever. I got to 213, but I'm pretty sure I have a few more squirrelled away in my pile of UFOs. I knew I had a lot, but I've been in denial...maybe it's time for a spring clean! I store my patterns exactly how you can see them in the picture at the top of this post - in cardboard storage boxes with the more fragile ones in plastic sleeves. The boxes live on a bookshelf in my sewing room, which I'm guessing isn't too hot/cold, light/dark or humid/dry as they all seem to be doing just fine. However, if you'd like to take better care of your vintage patterns, these two posts seem pretty helpful. Call me shallow, but when choosing patterns it's all about the artwork! I rarely look at a line drawing and get excited, but if I like what I see on the envelope then I'm sold. I know I miss the potential of loads of patterns and get swayed by pretty pictures even when I know a design won't suit me, but you can't dispute the beauty of vintage sewing patterns. So much detail went into the envelope artwork back then, especially ones from the 1930s and 1940s, including hair and make-up, jewellery, accessories and shoes! If you look at later patterns, shoes are often unfinished or just a bland sketch...but look at the detail in the beauties above! 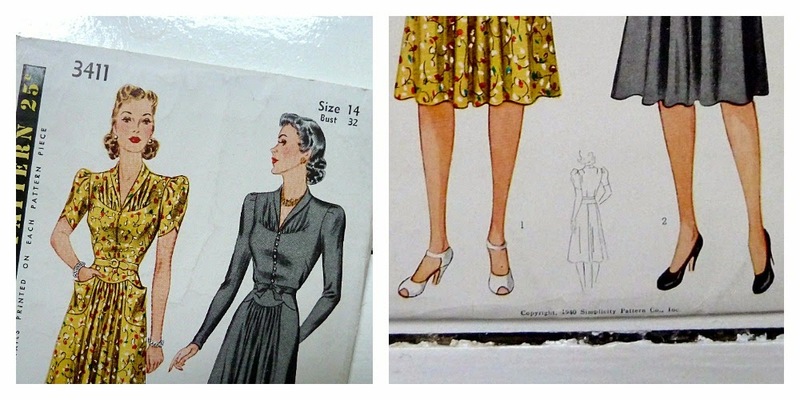 When I first started collecting vintage patterns I was quite literally obsessed by the late 1930s and 1940s. I found the elegant designs alluring and nostalgic in a way I can't even explain. Although I still have a soft-spot for patterns from those decades, I was wary of creating a 'costumey' wardrobe, so I looked to the 1950s and early 1960s for simpler and more wearable designs. I do think, however, that carefully considered fabric choices and simple adjustments can help integrate patterns from all four decades into a wardrobe suitable for my modern lifestyle. Ironically, the oldest pattern in my stash (as far as I know) is also one of the best preserved. Simplicity 3296 was released in 1930, but I originally bought it thinking it looked very 1940s! Either way it's absolutely stunnning, but I've yet to make it...perhaps this year's #vintagepledge will be the push I need!?! With so many gorgeous patterns in my stash, it's actually impossible to pick just three favourites and I think my choices would change depending on my mood, the weather and so on. However, I do adore the ones pictured above, partly because they're beautifully illustrated, but mostly because they combine simple lines with really interesting details. Now to find identical fabric prints...especially that leaf print...swoon! After banging on about how much I love 1930s styles, this pattern is just too 1930s and would never fit in with my casual lifestyle. Yet, I don't think I can part with it. Does anyone else hoard patterns like this in their stash? Can you explain why we become so attached? At first I bought a lot of my vintage patterns on ebay, which was fun until I got stung in vicious bidding wars. Discovering Etsy was a game-changer and is probably the sole reason I now have so many vintage patterns! There are so many sellers listing what seems to be an abundance of patterns, often at reasonable prices. Just some of the shops I've tried and loved are: Sew Unique Classique, One More Cup Of Tea, Studio G Patterns, She'll Make You Flip, anne8865, Sydcam123, Adele Bee Ann Sewing Patterns, Grey Dog Vintage, Viennas Grace, Vintage Pattern Drawer, Aunt Nonnies Nest and Yard of Goods. There are many, many more though that you can discover by using the search box to find patterns from specific decades, companies, etc. I've also had some luck in local charity and vintage shops, but for me Etsy has been my favourite source of vintage sewing patterns. 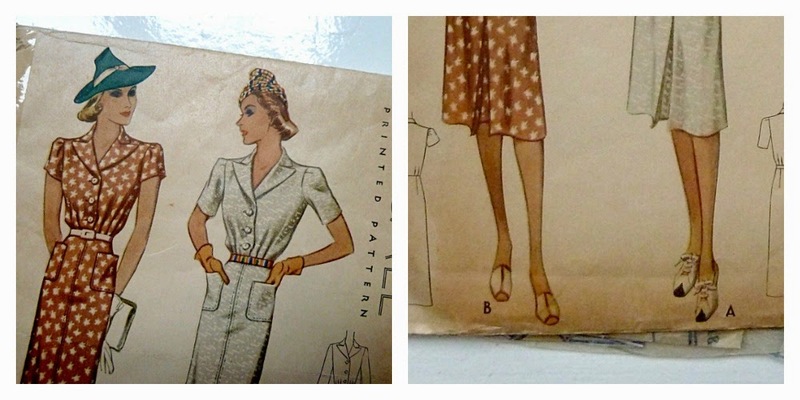 I hope you enjoyed this whistle-stop tour of my vintage sewing pattern stash! Kerry will be sharing hers this coming week, so don't forget to check out her blog. From February we'll be sharing monthly vintage pattern collections, as well as discount codes and giveaways...all in the name of #vintagepledge! I love to read posts like this! And thank you for sharing your resources, I've been looking around to get my hands on my first vintage pattern, so it is nice to see where others get them from. Can't wait to see what you have up your sleeve for this series! I always enjoy seeing what other vintage pattern enthusiasts have in their stashes--thank you for sharing! I've thought about participating in the pledge this year; I've probably got over 100 vintage patterns (not nearly as many as you, LOL!) and they're mostly what I sew from anyway...I'm in! What a fun read this morning! I, too, love vintage, but seldom make the garments any more. I doubt I will part with any of my collection--fun to browse through even if I don't sew them. Loving seeing your stash, I have a thing for the 60s and 70s. I agree that it is the artwork that lures you in. One of my favourite activities is just thumbing through all my old patterns. Oh my another vintage-pattern-aholic. I haven't even been able to calculate how many I have. I'm drawn to the 1940's patterns. Thanks for sharing! Its good to know I'm not alone. I cannot go past your oldest pattern, it is just so gorgeous. Looks flattering and easy to wear to boot - you should definitely make that this year! I too collect patterns that I'll never make - they are like artwork to me. My goodness Marie, over 200!! Great post, though, I've very much enjoyed the wonderful pictures/drawings and am impressed by how organised your patterns are! I don't wear vintage and have over 100 patterns just for the art work. Wow! What a collection! You are right - the artwork is beautiful. But I find myself disillusioned if I *do* make a vintage pattern and then don't look like the artwork ladies... Please can you make that 1 shouldered 40's dress? That is amazing!!! The artwork is what originally drew me into collecting and eventually selling vintage patterns. I have some I can't bear to part with and some I have parted with some reluctantly and am left with only a digital image. I'm a jeans and tshirt person and sewing is on the back burner right now for the most part! I love your collection! Thanks for sharing. Storing patterns in archival materials will preserve them for generations to come! Oh I love seeing others pattern stashes!! I am also drawn in by the artwork, it's just so lovely! Great collection. I'm the proud hoarder of hundreds of vintage patterns going back to the 1920's. I should put them in plastic. I've bought most at flea markets. Woo nice stash! Mine isn't as big as yours at all! Actually, I haven't counted them - though I will when I get your interview questions hehe. That pattern you wont make - I would TOTALLY make it! Probably view B though - it seems a bit more wearable. Not to say I dont love a giant sleeve but some of those 30s patterns have a giant sleeve, as well as ruffle, vents, buttons, pin tucks and fancy collars - all in one garment *phew* its enough to leave a smallish girl positively drowned in design details heh. What fun to read about your collection. I had so much fun starting mine a couple of years ago. I got quite a stash started that I haven't been able to add to yet, but I was quite thrilled to get a jump on things at an antique store my MIL took me to on vacation a couple of years ago. I never wear vintage fashions day to day. Instead I wear them to teach history. However the pattern you showed us that you'd never wear but will never get rid of...I'd wear that in my everyday world! It looks so classic and timeless! I love how you have them displayed, mine are in a vintage McCall pattern file that I scored on Craiglist. It's a great cabinet but it doesn't allow for viewing the envelope artwork. It's awesome to see other collections. This post is very inspiring, I may have to do a similar blog post. Keep'em coming! I love and collect vintage patterns, so it's always fun to see other people's collections. Aren't they wonderful? I must add, however, that your Simplicity 3296 dates to 1939 (the end of the decade) or possibly even into early 1940. Note how the skirt has become fuller and the hemline has continued to rise from the long lengths of half a decade prior. A design from 1930 would not be drawn in at the waist. It would be a continuation of the flat '20s silhouette but with longer skirts than what we think of as the short flapper dresses. Wow that is some collection! I thought I had too many (despite having just picked up 3 more from ebay), but nowhere near that amount! My stash is all 70's as it's the only vintage that really does it for me. My obsession is not vintage but historical, 1890's - 1910, I can't resist reproduction patterns from that period in time! You really have some gorgeous patterns. I just love the artwork on those 30s and 40s ones.The one you'll never make is just as gorgeous but those sleeves are pretty wild! love your collection! please make that oldest 1930s one that year! it's beautiful! Wow, your collection is wonderful. I bet you had fun looking through it to write this post. I have the same fabric envy as you, especially that leaf fabric. So pretty! You really should make your oldest pattern this year; it is stunning. Can't believe it's described as 'Simple to make', though! Wow, your collection is wonderful. You must have had a great time looking through to write this post. I have the same fabric envy as you, especially that leaf print. So pretty! Seriously, I think we all agree the artwork is THE BEST. What a wonderful collection you have! 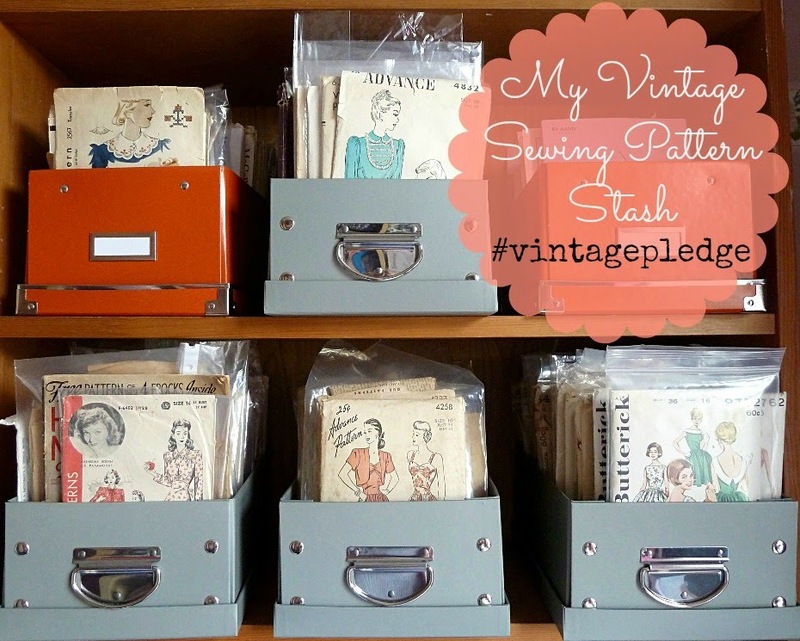 Hooray to vintagepledge! I love vintage patterns!! There is someting so charming about them, even if you know you will never sew anything from them. I just love to look at them, study the designs, and I wish I had more time to sew them all. Also, the prints are usually very original. There is a lot to look at! Thanks for sharing your collection! I love it! Great post! It's so much fun to take a tour through other people's collections. As others have said, hearing that your vintage pattern count is 213 makes my little indulgences on Etsy & eBay feel far less outrageous! I think it's not just the artwork, but the styling on those old pattern envelopes that's so wonderful - they take you right back into the era. I love your reflections on your vintage pattern collection. The sight of those beauties makes me swoon! 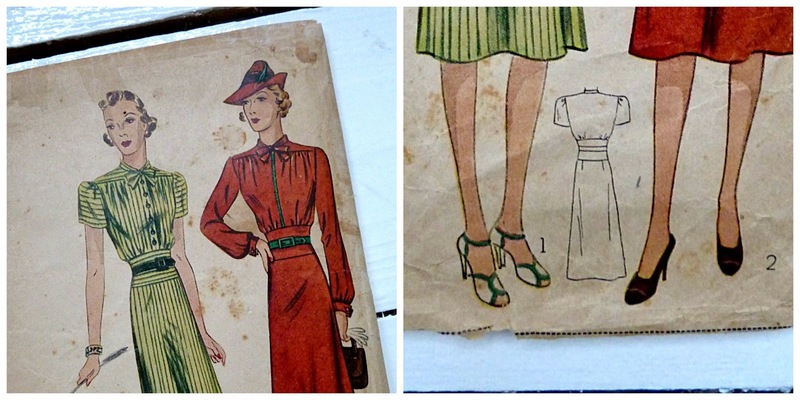 I must admit that a lot of the time, I am drawn to the envelope art on vintage patterns too. It's going to be fun to see these features each month! A brilliant post and I loved reading about your amazing pattern collection; you have some real beauties in there. I think I might have a slight case of 'pattern-envy'! What a fabulous collection, I want them all! My favourite period is the 1940's - very elegant but also strict and cool.